Another Ordinance of the Art of Geometry. The MS is a very small quarto on vellum, and is No. 17, A1. in the Bibl. Reg., British Museum. It is described in David Casley’s Catalogue of the MSS. of the Old Royal Library, 1734, page 259, as "A Poem of Moral Duties: here entitled, Constitutiones Artis Gemetrie secundem Euclidem. - 'Whoso wol bothe wel rede and loke.'" The existence of this MS. has been known for a long time, but its contents were mistaken until Mr. Halliwell-Phillips drew attention to it in a paper "On the introduction of Freemasonry into England," read before the Society of Antiquaries in the 1838-9 session. He thereafter published two small editions of a work entitled "The Early History of Freemasonry in England,"giving a transcript of the poem. The facsimile is the exact size of the original. 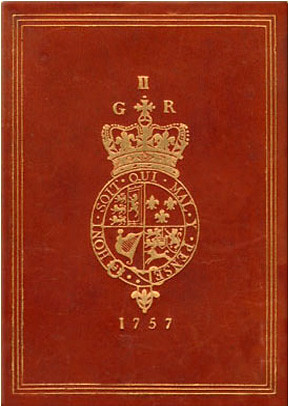 It bears the Royal arms stamped on both covers, and G.R.II., with the date 1757. The lettering on the back has also been reproduced. The MS. was bound in its present cover in or about the year 1838. The age of the MS. has been variously estimated. Mr. Halliwell and the late Rev. A.F.A. Woodford supposed it to have been written about 1390, or earlier. The MS. is admitted to be the oldest genuine record of the Craft of Masonry known. Mr. Halliwell pointed out that the writer of the poem was evidently a priest , from the words, "And when the gospel me rede schal," on line 629. He also drew attention to line 143, which intimates a still older MS. must have existed when the poem was written. Hic incipiunt constituciones artis gemetriae secundum Eucyldem. Here begin the constitutions of the art of Geometry according to Euclid. 15 And pray we hem, for our Lordys sake, And pray we them, for our Lord’s sake. 18 Bothe wel and onestlyche, ful sycurly. Both well and honestly full securely. 25 For the moste oneste craft of alle. For the most honest craft of all. 30 Thys onest craft he putte hem to. This honest craft he put them to. 36 Hys name hyt spradde ful wondur wyde His name it spread full wonder wide. 42 And love togeder as syster and brothur. And love together as sister and brother. 52 For cause they come of ladyes burthe. Because they come of ladies' birth. 56 Thys craft of gemetry yn Egypte londe. This craft of geometry in Egypt land. 60 [G]er that the craft com ynto thys londe, Ere that the craft came into this land. 66 An to worschepe hys God with alle hys my[g]th. And to worship his God with all his might. 74 By good consel, [g]ef hyt myt[g]th falle. By good counsel, if it might fall. Here begins the first article. 104 Thy worschep, thy profyt, hyt shcal be most. Thy worship, thy profit, it shall be most. 118 To that semblé withoute fabulle. To that assembly without fable. 126 As [g]e mowe knowe by good resowne. As you may know by good reason. 132 May fache the prentes whersever he go. May fetch the 'prentice wheresoever he go. 136 That hyt mygth greve summe or alle. That it might grieve some or all. 142 Take a prentes of herre degre. Take a 'prentice of higher degree. 146 Toke thys gemetry, that ys ful good. Took this geometry that is full good. 156 Schulde do the craft but lytul good. Should do the craft but little good. 160 [G]e mowe hyt knowe long [g]er ny[g]ht. You must it know long ere night. 164 Also muche as hys felows don, yn alle vyse. As much as his fellows do, in all wise. 166 So ys not he, [g]e mowe sen hyt. So is not he, you must see it. 171 Thenne hys felows, that ben ful perfyt. Than his fellows, that be full perfect. 176 Hys hure may ful wel amende. His hire may full well amend. 180 Schal no thef nowther clothe ny fede. Shall no thief neither clothe nor feed. 184 Lest hyt wolde turne the craft to schame. Lest it would turn the craft to shame. 186 That the mayster may hyt wel do, That the master may it well do. 190 And take for hym a perfytur mon. And take for him a more perfect man. 192 My[g]th do the craft schert worschepe. Might do the craft scant worship. 206 That longuth to a maystur mason. That belongeth to a master mason. 220 Ther schal no mason medul withalle. There shall no mason meddle withal. 224 To brynge the werke to ful good ende. To bring the work to full good end. 230 [G]ef that y cowthe amende hytte. If that I could amend it. 244 Whersever he go undur the sonne. Wheresoever he go under the sun. 250 Of hym dyvers poyntes may lurne. Of him divers points may learn. 260 And hymself to mechul blame. And himself to very much blame. 262 Of grete lordys and maystrys also, Of great lords and masters also. 268 For that they craft wol that thou do. For that thy craft will that thou do. 286 And brynge the craft ynto gret schame. And bring the craft into great shame. 294 [G]et he wolde have the same lawe. Yet he would have the same law. 304 [G]ef he thenke wel for to thryve. If he think well for to thrive. 310 Ofte aryseth ful gret debate. Oft ariseth full great debate. 319 To suche ende thenne that hem drawe, To such end then that you them draw. 320 That they stonde wel yn Goddes lawe. That they stand well in God’s law. 328 No more thou woldest he dede by thyne. No more thou wouldst he did by thine. 334 For suche a fowle dedely synne. For such a foul deadly sin. 342 To both partyes, and that ys good ry[g]th. To both parties, and that is good right. 366 Any brynge thyself ynto gret blame. And bring thyself into great blame. 372 Whenne thy felows wollen that thou do. When thy fellows wish that thou do. 379 Throw[g] false sclawnder of suche fame Through false slander of such fame. 380 May make the craft kachone blame. May make the craft acquire blame. 406 With swete wordes noresche hym love. With sweet words nourish his love. 418 That longuth to the craft bothe fayr and fre. That belongeth to the craft both fair and free. 426 Nowther for hys good, ny for hys kyn. Neither for his good, nor for his kin. 434 To be trwe to hym, over alle thynge. To be true to him over all thing. 438 Of the masonus, be they luf, ben they loght, Of the masons, be they lief be they loath. 440 That hath ben ordeynt by ful good lore. That hath been ordained by full good lore. 446 And to the semblé let hym be brow[g]ht. And to the assembly let him be brought. 460 And swere hyt never more for to use. And swear it never more to use. 470 Tyl hyt be oure lege kynges wylle. Till it be our liege king’s will. 482 [G]ef that eny of hem ben thenne y-broke. If that any of them be then broken. 490 That y have by my dygnyté. That I have by my dignity. 496 That he ordeydnt to thys craft by good reson, That he ordained to this craft by good reason. 504 Gravers and ymage-makers they were also. Gravers and image-makers they were also. 510 To turne the pepul from Crystus lawe. To turn the people from Christ’s law. 514 And weren yn hys serves ever more. And were in his service ever more. 532 The name of quatour coronatorum. The names of the quatuor coronatorum. 534 After Alle Halwen the eyght day. After Hallow-e'en the eighth day. 542 Seven myle the he[g]ghte schadweth the sonne. Seven miles the height shadoweth the sun. 550 That never won wyste what other schuld reche. That never one knew what the other should tell. 574 That con deperte falshed from trewthe y-wys. That can separate falsehood from truth, I know. 576 Whose useth hem wel, he may han heven. Who useth them well he may have heaven. 580 And to good norter, whersever [g]e com. And to good nurture, wheresoever you come. 584 Thenne [g]e fynden hyr y-wryten. Than you find here written. 592 To pray and wepe for here synne. To pray and weep for their sin. 598 With all thy wyttes, and eke thy my[g]th. With all thy wits and even thy might. 604 For hyse love that dyed on the rode. For his love that died on the rood. 618 In heven blysse to hav a place. In heaven’s bliss to have a place. 626 Latte non other mon by no way. Hinder no other man by no way. 655 Amen! amen! so mot hyt be! Amen! Amen! so mote it be! 656 Now, swete lady, pray for me." Now sweet lady pray for me." 682 Wol kepe hem to the ful welle. Will keep them to thee full well. 692 That yn churche ther don yse. That in church there done is. 702 Thyn owne worschepe tou save so. Thine own worship thou save so. 708 Yn hys face lovely thou loke. In his face kindly thou look. 714 Thou hast gret nede to governe the welle. Thou has great need to govern thee well. 720 That ys norther good and clene. That is nurture good and clean. 722 Forsothe, good norter wol save thy state. Forsooth good nurture will save thy state. 726 Gode maneres maken a mon. Good manners make a man. 730 But [g]ef that thou do hem know. Unless that thou do them know. 740 [G]er thyself to hyt reche. Ere thyself to it reach. 750 Then were hyt no curtesy Then were it no courtesy. 752 When thou begynnyst to drynke or speke. When thou beginnest to drink or speak. 761 For suche worde my[g]ht ther outberste, For such word might there outburst. 762 That myg[h]t make the sytte yn evel reste, That might make thee sit in evil rest. 764 And kepe the wel from "had-y-wyste." And keep thee well from "had I known". 768 Ny make no ragynge with rybody. Nor make no lewd sport and ribaldry. 778 Do hym revera(n)s after hys state. Do him reverence after his state. 788 Nowther at the wyn, ny at the ale. Neither at the wine nor at the ale. 793 Amen! amen! so mot hyt be! Amen! Amen! so mote it be! 794 Say we so all per charyté. So say we all for charity.